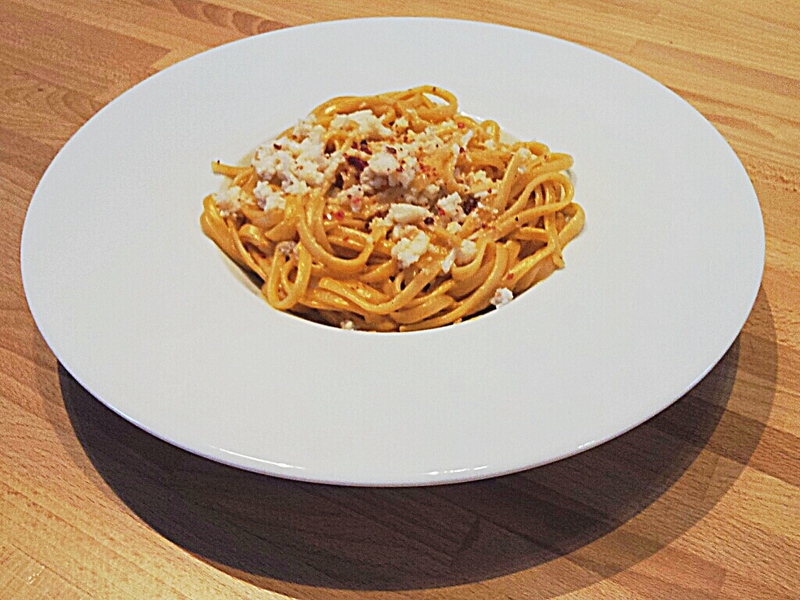 A Normandy Kitchen: Crab Linguine. We just got back from a new Italian restaurant, Piatto Pizzeria but you know I could make your linguine the entree!! Looks delicious Ivan. Here's to a great weekend for you and yours. Thank you, hope you had a good evening. Have a great weekend also, we are off to see some friends soon (Aston is excited for the car ride!) - meant to say you could use soya cream and olive oil with some lemon juice. Crab, lobster any seafood....love! I really want to try this recipe, Ivan. Any chance Aston got a sniff of any of the morsels? Sophie wants to know! Thanks, I am the same for any seafood. Aston is very quiet on fish/seafood days but meat roasting days... well, he will happily yap for the full cooking time!! Have a good weekend, (as I said above) we are off soon to see some friend's new house - sort of hoping there were no dogs before as Mr.Aston can be an angle or very naughty in different houses!! What will today be?! I love seafood, and this looks delicious! Thank you, I am the same as you, loving anything seafood!! We are very spoilt here for produce also. Have a good weekend! That sounds and looks so tasty, defiantly a nice light summer dish. Thanks, I think you are the only one who doesn't have to imagine the sun !! Have a good weekend! Thanks, exactly it's nearly Christmas and I am enjoying the lead up to it! I will have to make it with tomatoes and lemon. Have a good weekend! I am catching up on blogs this morning as I have been so busy with Christmas baking, well and everything else! LOL! This sounds like a fabulous pasta for a romantic dinner. 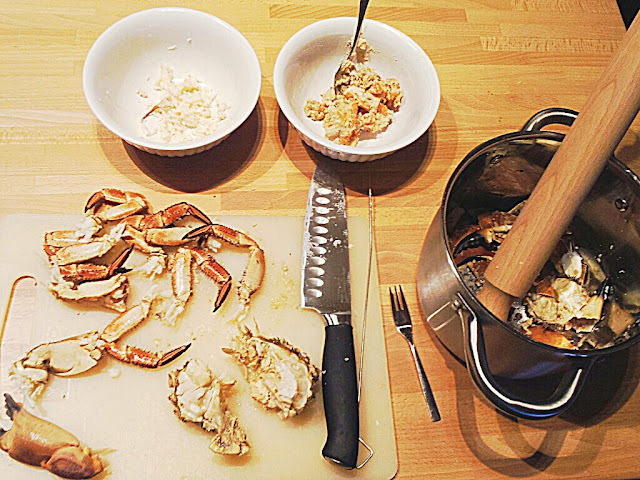 I am allergic to shellfish but I still cook with it wearing gloves for my hubby who loves it. He would love this and I could just have chicken with mine. Elegant and simple. I love pasta!! Sorry you can't eat it, my other half is allergic to shellfish too! I have to make two dinners also. Hope your doggies have been good while you were baking!! Have a good weekend. I love your Christmas tree. Oh, I bet this is really good. I have never bought crab in my life but then, I do live in Georgia! Here's the thing though, I really want to make your chutney recipe! That sounds so good. Maybe I will become a good cook by reading your blog. I have been married for 29 years now and my husband hopes I will become one too! One day! HA. Tell me the EASIEST recipe you have on your blog, one you think I could do, and I will make it. Will you please? Thank you! Sorry late to reply, just missed your mail as I was on my way Saturday! 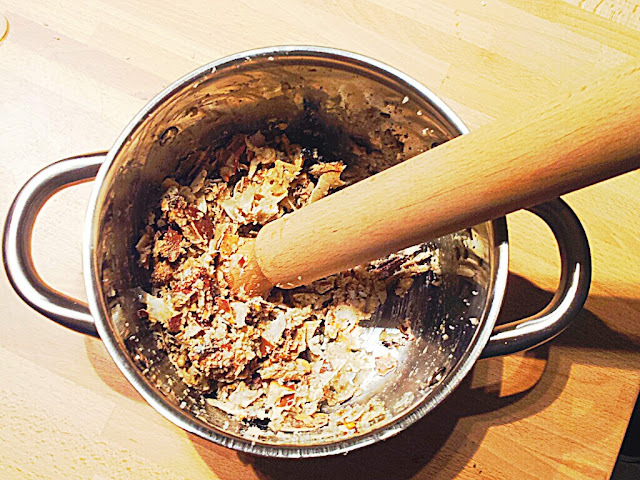 'You can do it' - make the chutney... I think if you want to start some place easier, the first recipe of minestrone soup is the best. It is a wonderful cutting exercise and also so much taste and passion from just 'water and vegetables' - it will give you the incentive. I also have some things coming up this week and next, as my food goes decidedly British over the Christmas period and I think you hubby will love the sausage rolls I make. So keep an eye out and I will give a short cut or two and add an extra photo or two for you!! Thanks, I will look that one up! I am a "one-pot" kind of cook. I love soups and chilis and stir-fries! Oh, yes I will be very interested in your British recipes! Keeping in mind that my husband has celiac disease and I have to adapt anything and use rice flour/corn starch mixture rather than regular wheat flour. It's funny, I have read TONS of recipes and food blogs but the one that has inspired me has been Marie at The English Kitchen and now, yours! I told you I have an English heart! Hope you have a good week ahead too! You are ideally placed as Nantucket Daffodil (below) and I were just talking yesterday about Celiac disease as her young daughter suffer from this also, she has a beautiful blog you may like to read. I plan to post some recipes in the New year on the subject. I will keep in mind alternatives for things (like the minestrone soup will be with rice noodles) - I also read the English kitchen too! Ivan this looks fabulous. I love anything with seafood, and I am lucky to live near the shore where fresh seafood is readily available. Just noticed in your profile that you make Calvados...I am intrigued! Kisses to your sweet puggy! Thank you, we are the same for living not to far from the sea and to go to the port in the summer and buying fish/seafood off the boats is a joy. Yes, we make Calvados, I start a blog and was excited to post the processes and what happens, NO APPLES this year (frost killed the flowers)!!! Which is a first in the 12 years we have been doing it! It will mean a bumper crop next year, too much to just distil nowadays (an old distillery truck, powered by wood, arrives at the house and yes, we pay all the duty tax! - customs turned up once and were very shocked to see everything was legitimate and all the papers in order!, I think they were actually disappointed!). Last year we sold most of the apples as our small trees we planted have grown! So... next year there will be more about cider and Calvados! How fascinating! Sorry about the apples. We have had years where we have had no apples...caterpillars ate the first set of leaves, then the tree must have had to put so much energy into actually producing a second set, there were no apples. A distillery truck...how cool! We are looking into buying a small copper still to make lavender essential oil. Do you have to pay the duty/customs because you ship? or just because it's alcohol? Look forward to next year's crop! I love seafood! Wish I could eat it every day, unfortunately the fish is incredibly expensive here so it is limited to a few times a month :( And it does not help that we live near the Swedish border either, where food tends to be cheaper. The fish are just as expensive there. I do not actually know much how to prepare crabs, so thank you for guiding and being so accurate with the description. Delicious with crab and pasta, you're absolutely right. And nice with a glass of cold wine also. You're welcome Ivan, I love coming here!! It's nice if others discovers your blog too, I just wanted to share :) How did it go with testing the new canapés today, was it successful ? Have a great start to the week, and thank you for stopping by. I am a butter fan but try yo be reasonable! Fish is a favourite in my home and can be expensive here too but there is always a selection of prices in France which is good. I know Sweden well, as we have a few Swedish friends (love going there!) and I remember things being more expensive there - even if they were wonderful. I am just happy to show and share all that I know or have taught myself, we never stop learning! Have a happy week also.